Now that Warner Bros. have revamped DC and Mortal Kombat, hopefully they can turn their attention to reinvogorating the hilarious characters of the Looney Tunes cartoon line. In November, DC helps kick the likes of Wile E. Coyote, Speedy Gonzales and Daffy Duck back into the limelight, offering 25 amazing variant 'looney tune' covers, roaring across their core super hero range. 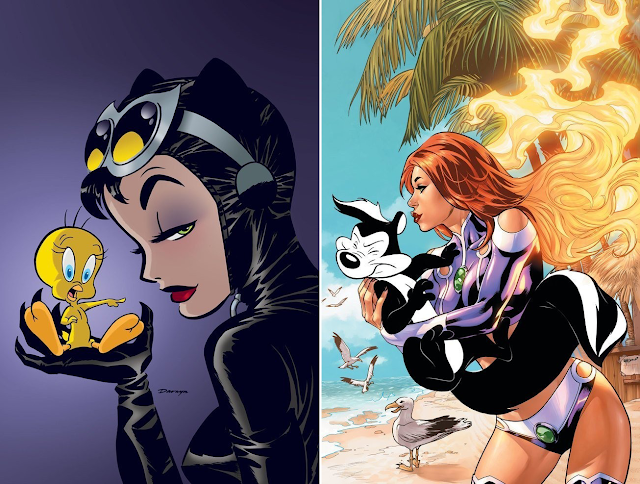 Featuring match-up's like Black Canary and Foghorn Leghorn, as well those featured here (from top to bottom: Catwoman #46 by Darwyn Cooke, Starfire #6 by Emanuela Lupacchino & Tomeu Morey, Sinestro #17 by Dan Panosian, Aquaman #46 by Ivan Reis & Brad Anderson, Green Arrow #46 by Kevin Nowlan, Robin: Son of Batman #6 by Pat Gleason & Mick Gray - all done with the aid of and Warner Bros. Animation), even for people like me who HATE variant covers, these are an amzing idea and worth every penny. For the full range, click here.